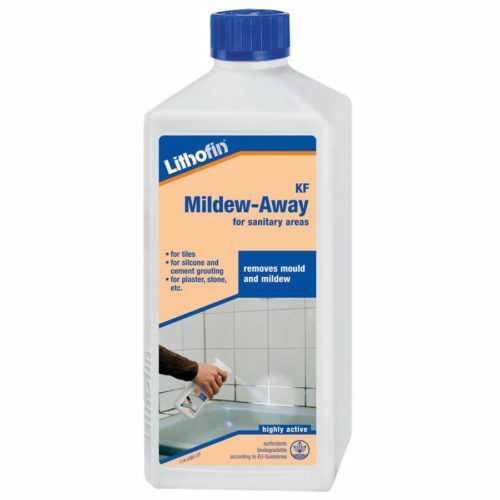 A special product from the LITHOFIN-Range for ceramics, quarry tiles and porcelain (KF). 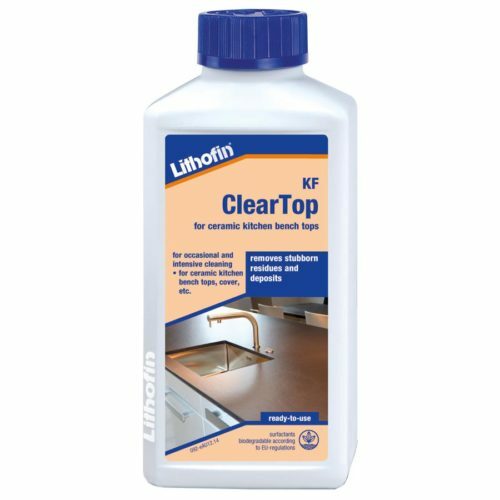 Lithofin KF Cement Residue Remover is a highly active cleaning concentrate based on a special composition of acids and supporting agents. The product is nearly odourless and does not develop any vapours. 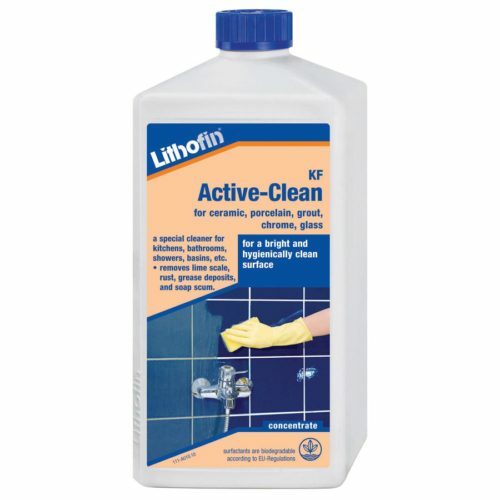 Lithofin KF Cement Residue Remover dissolves anorganic deposits such as cement and mortar residues, residues of flexible grouting materials, efflorescence, rust and calcium deposits. The dirt can then be completely removed from the surface. 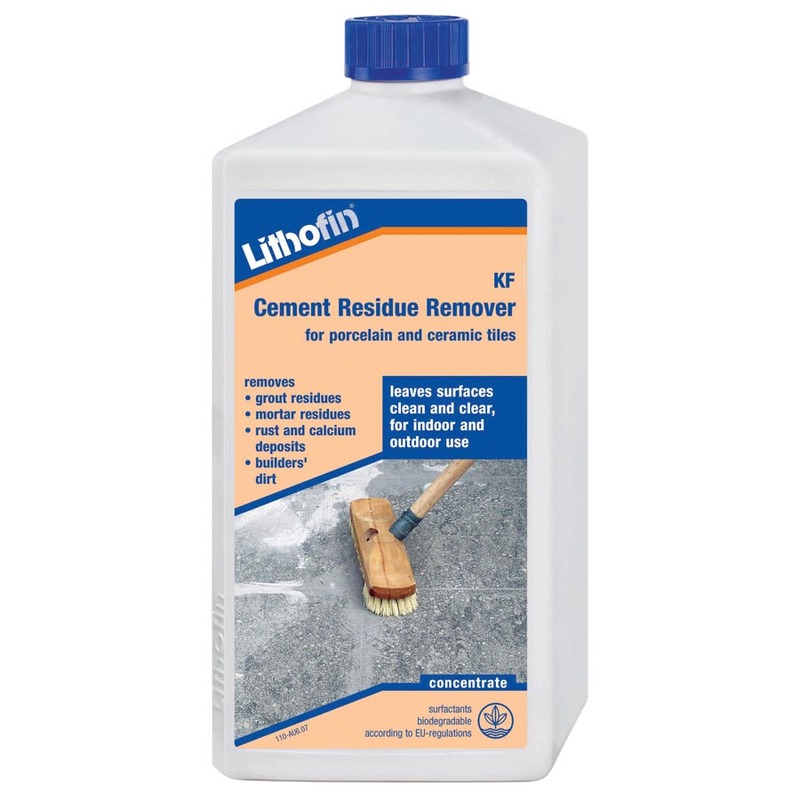 Dilute Lithofin KF Cement Residue Remover approx. 1:4 with water depending on the stubbornness of the deposits. Apply the solution to the wet surface and spread with a mop, white pad or scrubbing brush. Redistribute several times. After 10 minutes, brush the surface and rinse the solution with a sponge or a wet and dry vac. Rinse well with clear water. In case of cement based grouting materials, the dilution rate can be adjusted to 1:15. Coverage: approx. 20 to 30m² depending on the type and degree of dirt. Ingredients: acids, <5% non-ionic surfactants, <5% cationic surfactants, perfumes. b 8, UN1760 corrosive liquid, n.o.s.